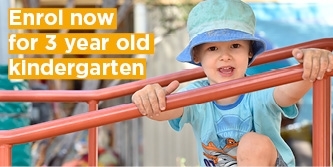 Somers Parade Kindergarten is a safe, supportive and stimulating environment where your child will be given every opportunity to discover their full learning potential. Most importantly, we provide a caring and welcoming environment where we have lots of fun! Our kindergarten offers a play-based curriculum. That's because we believe play helps children understand their world by “playing out” what they have seen. It also helps children learn and discover in an interactive environment responsive to their needs. This gives children a chance to communicate with peers in a comfortable environment and promotes the development of life skills and competencies. 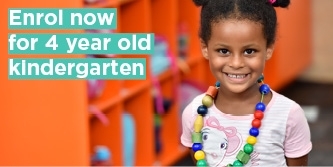 These include creativity, aesthetic awareness, self-esteem, empowerment, intrinsic motivation, curiosity, critical thinking skills, language skills, analytical skills, decision making skills, ecological awareness, cultural awareness, technological awareness, physical skills, perpetual motor skills, social skills, caring, communication skills, sustainability, musical appreciation, literacy & numeracy, cooperation and collaboration. We understand families are a child’s primary educators and pride ourselves on our trusted partnerships with parents and families. We welcome input and appreciate suggestions about any aspect of our programs. Somers Parade Kindergarten has been rated as Exceeding National Quality Standard. Information about the National Quality Standard. Our rich outdoor playground incorporates large open spaces and cosy corners with beautiful native plants and mature trees. Your child can explore many different learning environments including the large sandpit, digging patch and fairy and vegetable gardens. We'll teach your child the importance of sustainability through water conservation, recycling and composting. Our indoor spaces inspire a sense of wonder, exploration and investigation. We offer permanent learning areas such as a library, blocks, painting, dramatic play, puzzles and creative arts where your child can engage in purposeful and meaningful learning. We recognise the importance of physical activity, and we are a Kids Go for your Life accredited service. We also offer a Playball program and yoga classes, music and movement sessions.